For this topic, I will offer some helpful tips for a successful electric radiant heat wire installation project. If you have any questions regarding this topic, please feel free to contact me directly. Before I discuss this topic I want to give a quick history as to how I acquired knowledge about successful heat wire installations. For over 20 years, as a side business in Western Washington, I have been troubleshooting and diagnosing electric in-floor heat wire installations that were somehow damaged during the installation process. Using electrical testing equipment, fault locator and a thermal imaging camera, I can pinpoint the exact location of the damage that occurred in the wire. During this time I have pretty much seen it all. I say “pretty much” because just when I think “I have seen it all”, someone comes along and damages a wire in a way I have never seen before. It seems to be a continual process for compiling a list of do’s and don’ts. The advice I offer covers the most frequent issues that I have come across in doing these diagnostics and hope it assists you in having a successful floor heat wire installation. Get a digital multimeter and test the heat wire before you take out of the box. Get an audible monitor and connect to the leads of the heat wire. Make certain the “cold lead” section and the “end splice” are installed in the floor and straight laid. Never use nails or staples to hold the heat wire to the floor. Never cut the heat wire to shorten its coverage. Never cross the heat wire over itself. Do not forget to install the thermostat sensor probe/s. Never drill through your flooring to mount something to floor or remove tile without knowing the exact location of the heat wires. Read the detailed tips for an easy way to do this. Never run a sharp tool between the tile joints to clean out cement mortar. Always take detailed pictures of your heat wire installation layout before you cover with flooring. If you are installing wood base trim and using brad nails to attach, be aware of the electrical leads going to the thermostat and do not shoot a nail into the trim near that location. For more detailed information regarding the tips listed above, please read further. For starters, the single most important tool you will need is a digital multimeter (examples shown here). The basic manual ranging multimeter will do just fine. They can be purchased at any home improvement store or electrical supply house. An average cost should be around $15 – $20 for a decent quality tester. I would suggest avoiding meters that cost $5 – $10 as I have found them to be unreliable. If you have any technical questions regarding how to set up and use the meter, feel free to contact me. Another tool I would suggest using is an alarm monitor like this example shown here, however this is more of a convenience tool than a necessity. It gives an immediate audible alarm if the wire was compromised. Now that you have your tools, let’s begin. First, before you take the heat wire out of the box you will want to do an ohm test using your multimeter. This is to confirm that the manufacturer has supplied you a properly manufactured wire. It does not happen very often, however, like any product on the market you can get a defective one. You want to test between the two heating element leads and ground wire to each lead separately. You will also want to test the heat wire after you have installed on the floor, then one more time before you cover with leveling cement, then once again before you install your finished flooring. All this testing may seem like overkill and depending on the pace of installation it may very well be. However, if you leave the project, you may not know who trampled over your newly laid wire or if a sharp metal trowel damaged the wire during the cement leveling process. These are two issues that using RPM Mats would eliminate. For technical questions regarding proper testing, please contact me. Before you start your project, I just want to give a quick dissection of how most wire systems are manufactured. The beginning section of the wire system is often called the “cold lead”. This is the segment that runs from the floor to the thermostat on the wall. They are typically made up of three wires, two are connected to the heating elements and one is the ground wire. Next is the cold lead splice. This is the area where the manufacturer attaches the cold lead wires to the heating element wires. It is usually indicated by a 3″ to 6″ heat shrink tube that is larger in diameter than the wires on either side of it, due to the connections underneath. Next in line is the heating element wires or also referred to as resistance wires. These are the wires that generate the heat when electricity is activated. The resistance wires run all the way to the end of the wire system and terminate at the “end splice”. The end splice is where the manufacturer joins the two resistance wires to complete the circuit. The reason I wanted to dissect the wire system was to address the two weakest locations of most wire systems, the “cold lead splice” and the “end splice”. It is important that the cold lead splice is installed in the floor and straight laid. A section of the floor may need to be notched out to accommodate the larger diameter of this splice. Hot glue works well to keep the splice section in place. If you do not install the splice in the floor and straight lay, it could get bent to a degree that could break the manufacturers connections when pulling the cold lead wires through the conduit running up to the thermostat. This holds true for the end splice as well. Do not bend, straight lay and hot glue in place. Next up, and one of the more common issues is the use of nails or staples to attach the wire to the floor. You should NEVER use nails or staples to hold the wire in place. Even if the heating wire was not physically damaged from using a nail or staple, if the wire gets pinched or compressed too tightly, it could cause the electrical current to load up in that location/s and cause a ground fault in the wire system. This could cause the thermostat to trip the circuit for protection of the wire. A common question I often get asked is “if I have too much wire at the end, can I cut the wire to shorten and make a new end splice?” The answer is simply “no”. The manufacturers use a different gauge of wire depending on the length of wire. If you cut a wire short that was designed to handle a certain length of electrical power, over time the wire may not be able to handle the electrical load and could burn itself out. Contact me if you need help with getting the wire you purchased for your project to fit into your heated area. If you ordered way too much there may be nothing I can do to help with that problem. It is important to know you have the correct size before you unspool the wire and install on the floor, as most distributors may not take back a wire that has been unspooled. This next circumstance happens very rarely, but worth mentioning. Never cross the heating wire over itself. The two points of contact would generate too much heat in a single location and will very likely burn through itself and cause a failure. So if you did not plan your layout properly and you come to a crossroads where your only option would be to cross over the heated wire with itself, you will have to start over and redo your layout. Do not forget to install the thermostat sensor probe wire after the heat wire is laid and before you cover with flooring. I bring this up because most manufacturers include the sensor probe in the box with the thermostat, which does not get installed until after your heat wire and flooring has been installed. How does that old saying go, oh yeah, “out of sight, out of mind”. By then it is too late, well not really, but a big pain to install afterwards. I would also strongly recommend putting a second sensor probe in floor at the same time as the original. It does not happen very often, but they can fail. The only way to fix this, is to go back out to the job, bust up a tile and cut another channel into the mortar to lay another probe and hope you do not hit the heat wire during this process. If you install two at the same time and run both of them up to the thermostat box, only hooking one up while leaving the other in the junction box unconnected, if one ever fails just disconnect and hook up the other one and you are back in business. Another frequent problem in regards to damaged heat wire is the process of drilling into your floor to mount something to the surface, or drill completely through the floor for plumbing pipes. Some common mounted items include; doorstops, bi-fold doors (has a bracket that needs to attach to floor), and the single most common issue is toilet bases and toilet mounting blocks. If you are using a traditional style toilet like they have been using for the past few decades then this is not a concern for you. Your only concern using this type of toilet is keeping the wire at the minimum manufacturers recommended distance from the wax ring. If you are using one of the new design style toilets then this will concern you. A lot of these new toilets have “mounting bases” that need to be mechanically fastened to the surface of your flooring. Also, some of the toilets are so long in the front that they need to be locked onto a “forward mounting block” that gets mechanically fastened as well. I will not go into specifics of how these attach, only to say check the toilet manufacturers instruction on how to properly mount your new toilet. If you know going in you will be using this style of toilet, be sure to let your heat wire installer know what to plan for in regards to wire layout. If any of these things need to be mounted after the heat wire has been installed, you have a couple of choices. The first option is to calculate the odds of hitting a wire that is approximately an 1/8″ in diameter and is spaced at 2″ to 4″ apart depending on your layout and then ask yourself “am I feeling lucky today”. I can tell you from personal experience, many people have been unlucky in that regard and have paid the price for that mistake. Now, all these wire systems are repairable should you damage the wire during this process. However, keep this in mind, you may have to pay a tile contractor to remove, replace and re-grout your floor. Then, if you have a diagnostic guy like me in your area to troubleshoot the actual damaged location, be prepared to pay a pretty penny for our service. Finally, most areas of the country require the heat wire repair be done by a licensed electrician, and they are not cheap either. The second option and the one I would highly recommend following is to purchase a “heat sheet”. They are a 12″ square liquid crystal sheet (LCS) that change color with the presence of heat. You can get purchase one HERE. You want to get the model# LCS-77 and cost $25.00 at present. The best method to use the LCS is to start with the heat wire system turned off and have a cold floor. Next, lay the LCS sheet in the area you plan on drilling. After that, turn the heat wire system on and wait for the heat wire “lines” to appear on the sheet. There you go, now you know exactly where your wires are under your flooring to have a proper plan of attack to drill successfully without hitting your heat wire. You have to start cold because once the floor gets to full temperature the LCS sheet can no longer distinguish the hot and cold area, as it will be one uniform color on the LCS. There are some scenarios where you may not have the option to drill in a location other than right in line with where the wire is running under your flooring. Items such as doorstops you have some flexibility as to where those can be installed. However, toilet mounts are very specific as to where those will need to be drilled. In that case, if no other options are available I would suggest removing the flooring and rerouting the wire to avoid the drill location. Follow the same steps for locating the wire layout prior to removal of tile. By marking the spacing of the wire on an adjacent tile you can avoid hitting the wire with a chisel during the removal process. Another common mistake made during the heat wire installation process is the use of a sharp tool, like a utility knife, to clean out thinset mortar between the tiles. If this needs to be done use something soft, like a cloth or sponge, or something dull like an old margin trowel with worn edges. Always take detailed pictures of your heat wire installation layout before you cover with flooring. Sometimes this information can be useful in locating a damaged spot in the wire. The most important part is taking a detailed picture of the end splice location. The reason, if the wire is damaged at the factory end splice it can be very difficult to diagnose that particular location of the heat wire. That section may use plastic connectors and fillers to protect the end and make it difficult for the diagnostic equipment to troubleshoot. Finally, if you are installing wood base trim and using brad nails to attach, be aware of the electrical leads going to the thermostat and do not shoot a nail into the trim near that location. Many states require the use of conduit to run the cold lead wires and thermostat sensor wires to the thermostat junction box. The use of metal conduit will protect the wire from brad nail damage, however, metal conduit can have a sharp edge at the bottom after it is cut to fit. This sharp edge is not recommended against the cold lead wires. For that reason many installers like to use plastic conduit which is a much safer alternative, yet it can be pierced by a long brad nail. To be safe, do not shoot a brad nail through your wood base anywhere close to the cold lead wires entry point in the wall. Need Help with Heat Wire Installation? Reach Out Today! I hope you found this advice helpful for a successful heat wire system installation. If you have any questions, please feel free to contact me anytime. 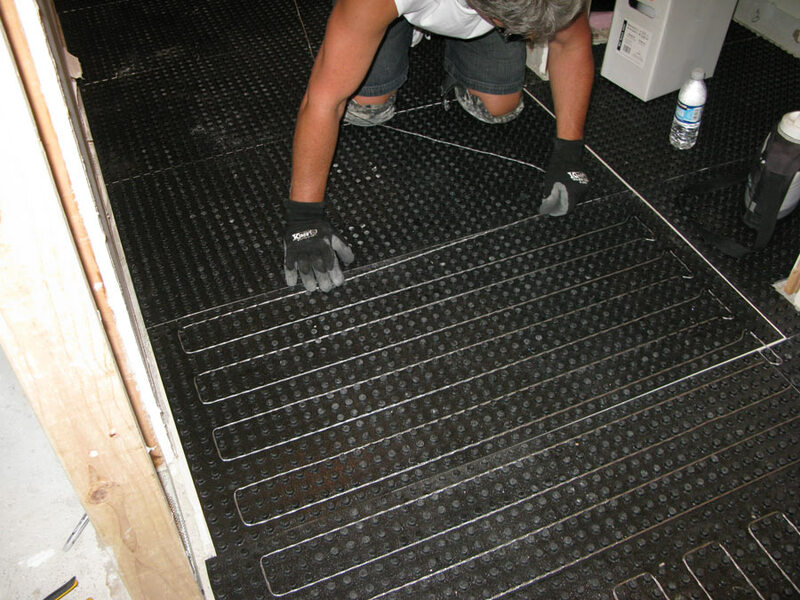 Remember, except for drilling through your floor, the use of RPM Mats will greatly reduce or eliminate many of the failures or problems that could arise during the heat wire installation process, along with making it so easy anyone can do it!